That the e-commerce marketplace is increasingly competitive requires business doers to pay more attention to how to satisfy customers. On the way to complete this mission, marketers need various supporting tools to ease management system and provide consumers better shopping experience. With the same purpose to help online merchants enhance customers’ satisfaction, Mageplaza PDF Invoice extension is created. With this helpful extension, admins can have PDF files automatically generated for each customers with two different choices in printing. What are these print options? For several Magento store owners, they are quite familiar with default invoices created automatically by Magento platform. However, these invoices are not well-organized and lack of information about sellers and the deal. With PDF extension provided by Mageplaza, billing documents for each order and each customers will be created in PDF files at ease with sufficient information attached. Besides, shop admins can offer buyers two options: print PDF invoice and print invoice when printing. Print PDF Invoice, supported by Mageplaza PDF invoice extension and performs as a tool to automatically generate PDF files for every order. Print Invoice is an option to print default invoice from Magento which do not offer PDF files for customers. Depending on personal purposes, users can decide to turn on both of these print options, or only one choice for all four billing documents: Order, invoice, Shipment, and Credit Memo. To start configuring this function, admins can access from Admin Panel > Mageplaza > PDF Invoice > Configuration, the system will bring admins to General Configuration page. Here they can easily find four kinds of billing documents to configure. First admins need to enable PDF attachment for all these document by unmarking Use Value System and selecting Yes option. In case they decide to apply Use Value System, the default setting for this part automatically allows PDF attachment to be created for customers. After that, with each kind of document, admins have to navigate Show Custom Print Button. Here admins can decide to apply Use Value System, they can tick on this box and mark it as chosen. In case admins want to make personal adjustments here, they can unmark Use Value System, then select among three options offered: Both, Custom PDF, and No. When admins choose Both, they offer customers two choices for their printed invoices. In case users select Custom PDF, only one option is offered to buyers, which is PDF invoices created by extension. If shop owners choose No, it means that PDF files are not selected to make invoices. After finishing configuration, admins do not forget to click on Save Config to make sure all changes are updated. When customers want to print any document related to their purchases, they can sign in, then access My Order. Here they can find all of their deals and select which one they want to get hard copies. Once deciding which order to choose, buyers can select View Order to get detailed information about this deal. The number of print options offered to customers all depends on admins’ configuration. If customers are enabled to choose between two options, it means that admins select Both in Show Custom Print Button. 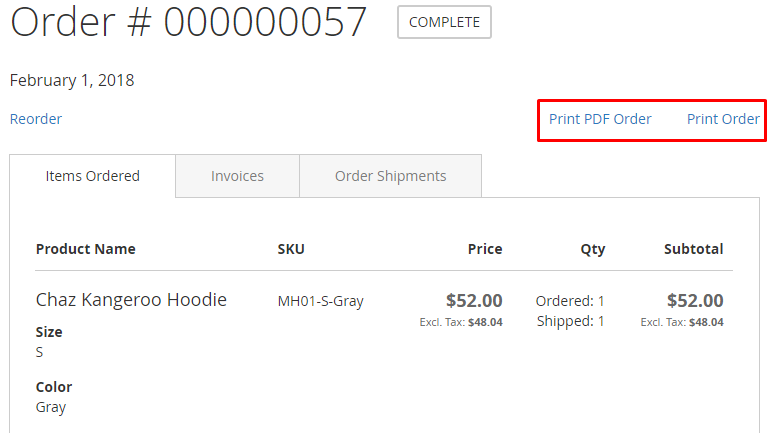 In case, admins select Custom PDF only one option is presented as Print Order. By clicking on this button, customers will automatically download PDF files which follow chosen template from stores to their devices. When admins save No for Show Custom Print Button, on the frontend, buyers can easily notice a Print Order button. However, when choosing this button, shopping doers will get the default invoices created by Magento instead of PDF files.